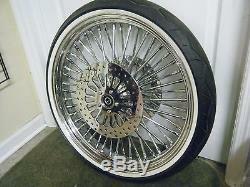 New Chrome 23" Mammoth Fat Spoke 23x3.5" Front Wheel & White Wall Tire Package for'08-'13 Harley Touring Models. This wheel is for Non-ABS 25mm axle Models ONLY. 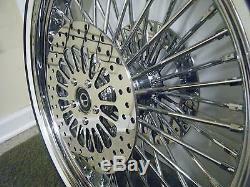 All chrome high quality HardDrive wheel has chrome billet hub and smooth spokes. Super Spoke 11.8 Rotors included (chrome hardware). New Shinko 777 130/60-23 tire (mounted). Ready to mount and go. Will not work with stock front fender. Have other size packages both front and rear available for'86 - Later Models. The item "Chrome 23 Fat Spoke Front Wheel White Wall Package 08-13 Harley Touring Non-ABS" is in sale since Wednesday, April 11, 2018. This item is in the category "eBay Motors\Parts & Accessories\Motorcycle Parts\Wheels, Tires & Tubes\Wheels & Tire Packages". The seller is "bassmasta430" and is located in Myrtle Beach, South Carolina. This item can be shipped to United States.